The most spectacular failed monsters are those that bring together elements never yet joined before - the head of a rabbit! the body of a lemur! tentacles that smear you with liquid cement! - but without apparent thought as to how all these elements make a viable whole. In problem-solving terms, the bad monster represents a lot of playing around with the puzzle pieces, but not hitting on a solution that works. This raises the question, "what works for a monster?" The answers are many, explaining why bad monsters are so hotly debated, as you can see if you even get two flumph haters and two flumph lovers (or at least flumph toleraters) in a chatroom together. Because of this, I am forced to conclude that no monster is bad in and of itself. Even the Fiend Folio's umpleby - yes, the umpleby, my friends, that hairy master of static electricity discharge - would make a great goofy character in a children's book. Or a cool Pokemon. It's just completely out of place in a dungeon. Problem-solving challenge. A monster's habits or abilities can make it a particularly memorable or versatile adversary. Trying to find its vulnerability (it's hideously ugly, was once human and has smashed every mirror in the mansion ... hmmm ...); being surprised by the classic "gotcha" monsters (whoever would have thought that ten foot pole was a giant stick insect? ), or just marveling at its strange tactics (it's using the vines on the ceiling to get away! ), are all things that make a monster interesting. The surprise factor, of course, drops dramatically once the monster is published and becomes generally known. And a DM who relies too heavily on "gotchas" like the mimic ... goldbug ... um, cloaker anyone? ... will end up with a paranoid, slow-moving, and generally disillusioned party, and a silly dungeon. Which, indeed, might be the point. Dark Ages or Ancient World epic: Pretty much only the monsters of that epoch's folklore, or plausible variants on the same, fit in. Satyrs and aegipans, not orcs. Medieval romance: This is the middle and dark ages as glimpsed and fantasized through the rear-view mirror, for 500 years of European history - from the Renaissance chivalry novelists (Ariosto, Spenser, Tasso) to Tolkien. Mythical, legendary, and wholly allegorical figures abound. Orcs rub elbows with hippogriffs and dragons. Stick with combinations of people, heraldic animals, and the occasional plant and you are on safe ground here. Weird fantasy and horror: Looking to far-past and far-future decadence and barbarism, this genre is much more forgiving of tentacles, blobs, giant insects, psionics, human-animal hybrids, and other quasi-science-fictional elements as long as they are eerie and frightening - just being weird is not enough, Mr. Umpleby. Prehistoric creatures are also fair game. Sword and planet: Alien worlds from the first half of the 20th century abounded in life forms bearing suspicious resemblance to earth creatures with dye jobs, extra limbs, horns, etc. Humanoids "evolved" from terran-analogue creatures are also common among writers less rigorous in their xenoanthropology than Burroughs. Weird fantasy critters can also be worked in; the main difference between the two genres is more in the equipment of the heroes than the nature of what they're fighting. Science fiction: And in this genre, the weirder the more believable. If it looks too much like an Earth-whatever, it's suspect. Natural or symbolic coherence: The really great monsters have parts that go together, and abilities that go with those parts; symbolically, if not literally. The griffin, for example, combines the nobility of the mammal and bird monarchs, for an ultimate symbol of ultimate nobility. The necrophidius, praised previously, combines two classic symbols of fear, and adds abilities in keeping with those of a snake - poison and swaying charm. 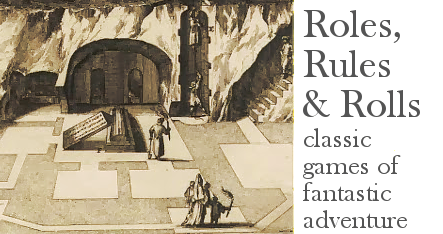 It doesn't hurt that it would also be at home in either a medieval or weird fantasy setting, and many people's conception of "proper D&D" combines the two of those elements to various degrees. The opposite of this is ability-platform syndrome. You come up with a great ability ... let's say, draining magic items. 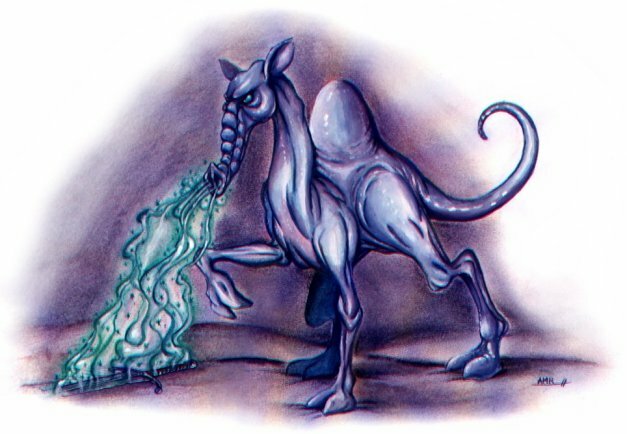 You then ruin that ability by taking about 2 seconds to decide it should go on a glowing blue camel with a prehensile trunk. Or jumble syndrome, where you jumble two or three critters together, add and subtract parts, and voila! The dread one-eyed gorilla shark of Planet Mongo. Again, great for gonzo or heavily sci-fi campaigns, but not so great for the fantasy genre most people are used to. Next time: The fine art of redeeming monsters; or, Captain Save-A-Flumph. I'll guess Dakon. It has nothing worthwhile going for it, and you've got two posts in a row with unbridled gorilla-rage. The illustration and description make it seem more like a hairy wild-man type, Gurgi from Black Cauldron for example. The monster I have in mind is much more of a groaner. 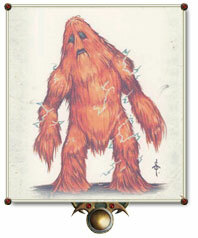 Looking at the original art from White Dwarf, I can see that they statted up Chaka from Land of the Lost. OK, my second guess is killmoulis. A failure as a kobold replacement, mostly because they live in the floors under mills, where adventurers spend approximately 0% of their time. Plus, the art for them is atrocious. I was going to say garbug, but they started growing on me. Flying lobsters is a good idea, the execution is just a little off. Both worthy louses, but I think you'll agree my selection is more uninspired by far. Next post, in fact. The real question is not market segmentation, but how you adapt a game to the new generation of users, where people spend a lot of time on-line just because it's convenient, and want their face-to-face activities to be short, well-defined and conclusive.